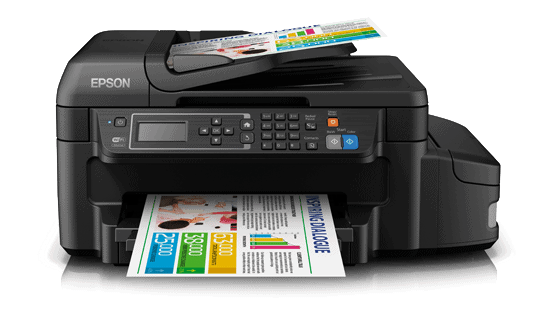 Epson announces the launch of their first ever duplexes InkTank printer – L655. This is an all-in-one printer with ADF, WiFi, networking, fax and duplex functionalities as well as a suite of connectivity features, aimed at achieving cost effective speed and quality. Ideal for office and commercial environments, the Epson L655 prints colour documents with razor-sharp text and images, and black prints that are additional water and smudge-resistant. It offers a reliable quality of 4800 dpi high-resolution output. With Epson L655, users can experience a world of wireless convenience with access to easy and flexible shared printing and mobile printing. The added advantage of Wi-Fi Direct allows the users to connect up to 4 devices to the printer without a router. The L655 also comes enabled with ethernet, ensuring superb connectivity and allowing you to easily share your printer within your work group for better use of resources. Users can enjoy print speeds of up to 13.7ipm for standard print, along with draft print speeds of up to 33ppm with Epson’s PrecisionCore printhead, offering versatile high-speed, high-quality solutions for commercial and office printing. The L655 also supports automatic duplex printing up to 6.5ipm, therefore reducing paper wastages. The printer is equipped with a 30-sheets ADF unit for convenient scanning and copying of multipage documents.The L655 Broadcast Fax and PC-fax functions allow users to send a fax digitally with their computer. It has 100-page fax storage memory that ensures incoming faxes even if the printer is out of paper or ink. Even with its multi-functional capability, the L655 is compactly designed to take up very little space compared to conventional designs, allowing users to fit it comfortably anywhere in the office or home. Epson genuine ink bottles are formulated to deliver outstanding high-volume print quality with L-series printers. Every bottle is individually sealed to ensure the purity of ink and comes with a smart tip designed for mess-free refills.